Spain Small Group Tours: 10 days with Amber Road » Our 17th year! 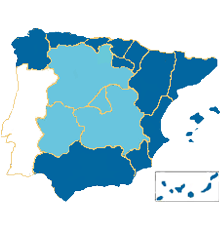 Central Spain takes us on a semi-circle journey through the regions of Castilla La Mancha, Extremadura and Castilla Leon. The great Gothic Cathedral and Santo Tomé Church with their wonderful paintings by El Greco await us in Toledo. We’ll discover the riches from the Americas in Trujillo. A cooking lesson in medieval Cáceres highlights our two-night stay. Mérida famous for its Roman ruins and art, will also offer up a paella lunch. Dazzling Salamanca (really!) is next, where you’ll find even more beautiful squares and the best tapas. We’ll walk cobblestone Zamora and taste Tempranillo wines at a Hacienda estate. 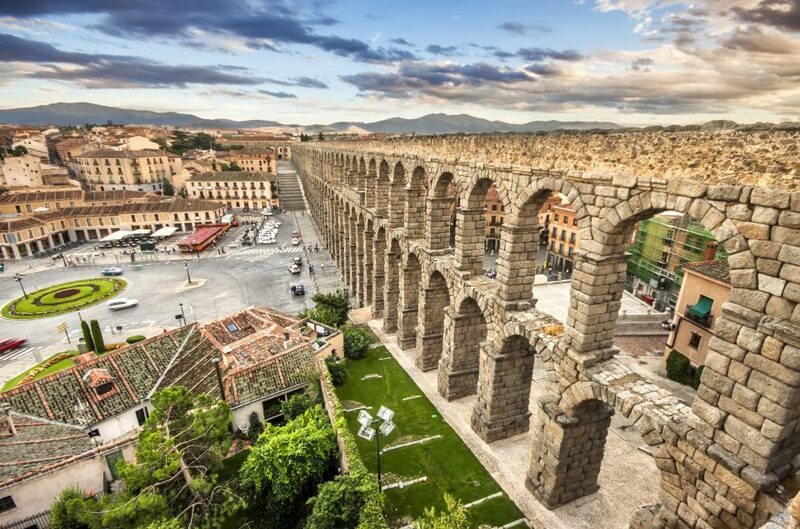 The incredible Roman aqueduct and Disneyesque Alcázar at Segovia will lead us on to magnetic Madrid, the Villa Real Hotel and the Prado Museum. Many civilizations have passed through Spain‘s long and rich history. During its centuries of navigation, exploration and global empire it disseminated Spanish culture and language worldwide. It has brought us Flamenco, classical guitars, bullfighting, tapas, gazpacho, paella and great wines. Its artistic merit can be witnessed in the works of Cervantes, El Greco, Goya, Velasquez, Gaudi, Dali and Picasso. Spain today is a young democracy, filled with vibrant and welcoming people. Early afternoon transfers from Madrid airport and city center to Toledo in the region of Castilla La Mancha where we will stay 2 nights in the former Renaissance palace, Palacio Eugenia Montijo. Orientation walk and welcome dinner. 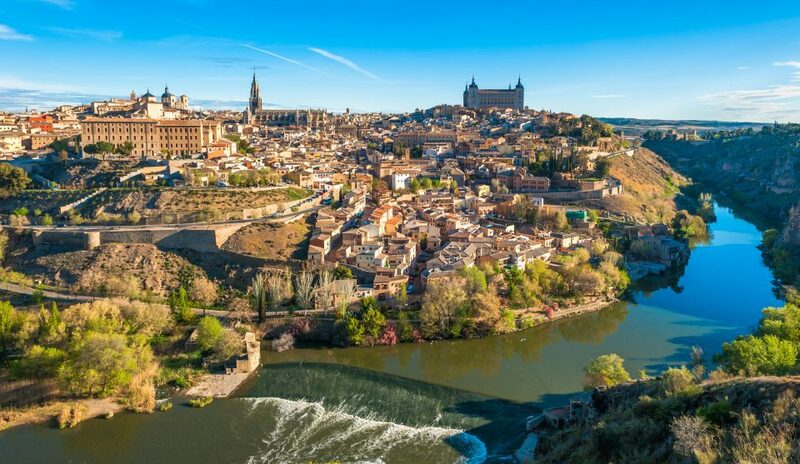 Toledo is strategically situated on a cliff surrounded on three sides by the river Tagus. 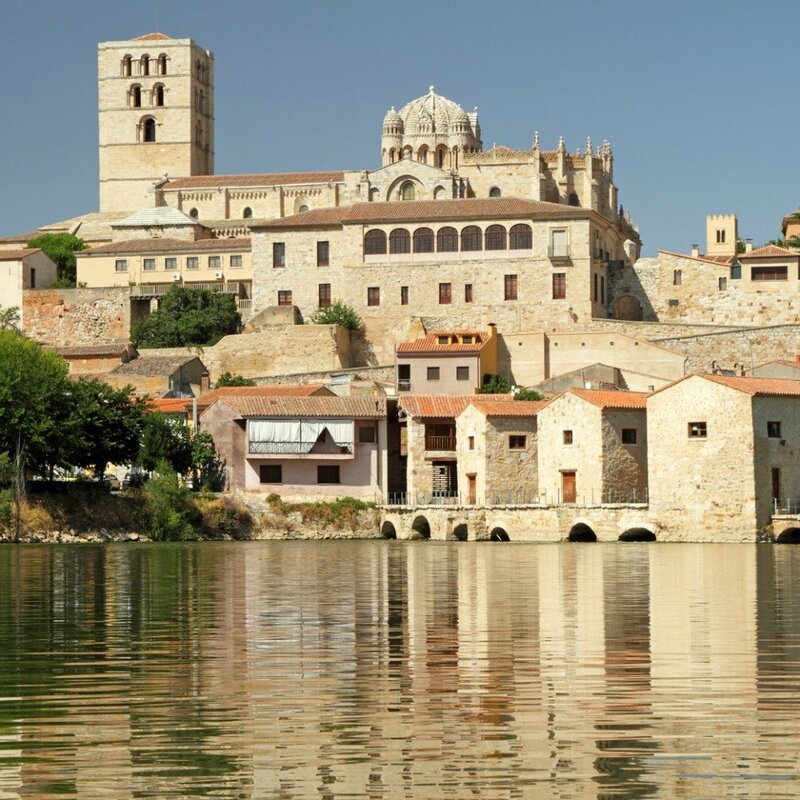 A Roman town since 192 BC, it became the capital of the Visigoths in the 6th century when it was recognized as the country’s religious center, initiating the close relationship between Church and State that has defined much of Spanish history. Muslims and Jews who remained were tolerated, but the Christians quickly established their authority converting mosques into churches, and then adding monasteries and convents. Their biggest undertaking was the great Gothic Cathedral, built on the site of the former Great Mosque, a political statement that Christianity was back to stay. Our morning local guide tour will take us through the narrow maze-like historical center, the old Jewish quarter, we’ll visit a synagogue, a mosque, the Cathedral and see the fabulous El Greco painting in Santo Tomé. El Greco was a painter, sculptor and architect of the Spanish Renaissance period. His unmistakable style of elongated, tortured figures, often religious in nature, were unconventional and dramatic for their time. Born on the island of Crete he was given the nickname, “El Greco” meaning “the Greek” to reference his heritage. After studying and working in Venice and Rome, he received a commission to work in Toledo where he lived for the rest of his life. Mid afternoon we’ll admire 30 of his paintings at the Santa Cruz Museum. Morning guided tour of colonial Trujillo, our first stop in Extremadura. 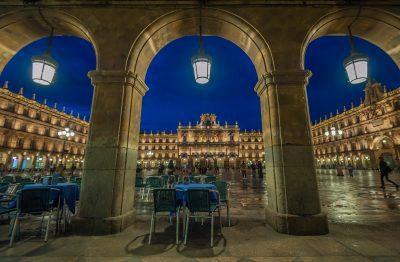 The town’s significance began when Spanish conquistadors such as Francisco Pizarro returned to Spain from the Americas and used their wealth to enrich their cities and build magnificent homes to celebrate their accomplishments. Arrival to Cáceres at El Parador, a former 16th century palace where we will spend our next two nights. Cáceres was a thriving city during the Roman occupation, languished under the Visigoths, rebuilt by the Moors, retaken by Christians in the 13th century, flourishing after the discovery of the Americas. As a result you’ll find Roman walls, 30 Moorish towers, Gothic and Renaissance architecture. The medieval town center is in pristine condition and was declared a UNESCO World Heritage City in 1986. A lesson in Extremadura cooking with dinner and Crianza wine will follow our guided city tour. Morning free in Cáceres followed by a mid-day departure for a paella lunch. Mérida settled by discharged Roman soldiers under the rule of Augustus. 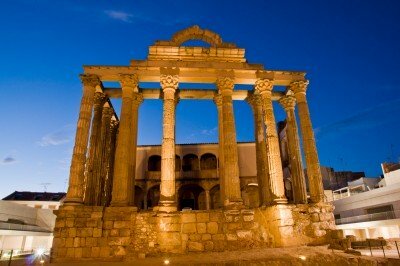 Its unique history has left us with not only the largest concentration of Roman ruins in Spain but also the best preserved. 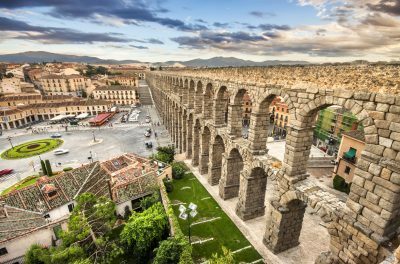 Our local guide leads us on an exploration of the ruins, from the amphitheater where concerts are still performed, to the Aqueduct of Miracles, the Temple of Diana and the longest Roman bridge in Spain. The impressive National Museum of Roman Art showcases wonderful mosaics and sculptures and depicts everyday life in a Roman colony. Evening on your own in Cáceres. 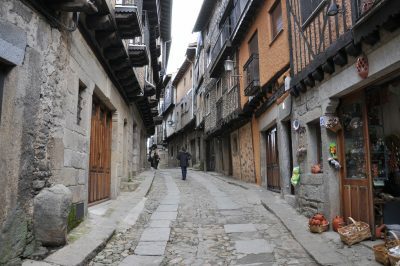 Today we ride through bull country up the Sierra mountain range to remote La Alberca, a well-preserved village of 14th century architecture, thatched roofs, flowered balconies and cobblestones. The town boasts Spain’s finest ham, the Jamón Serrano, produced by local pigs feeding only on black acorns. After a guided tour of the Casa Sátur, a traditional village home, you’ll have time to wander the narrow streets, sampling the many local delights like sweet honey almond turrón. Salamanca, located on the southwest corner of Castilla León, is a lively city with Roman ancestry and Moorish influence. It is home to the oldest university in Spain (1134) and is today an international destination for students interested in learning the Spanish language. Our morning local guide tour takes us over the Puente Romano (Roman Bridge), past the old and new cathedrals with visits to Casa de las Conchas and the university. We’ll wind down in the sun drenched Plaza Mayor, undeniably one of most beautiful plazas in all of Spain. Optional included afternoon visit to Casa Lis, an Art Deco and Art Nouveau museum housed in a 19th century mansion, considered to have one of the best collections of blown glass and porcelain dolls. 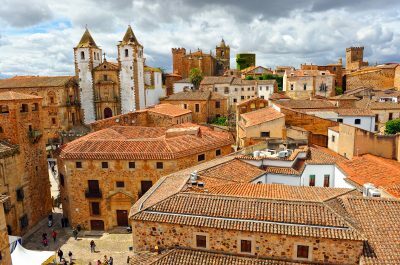 Called Spain’s loveliest town by many, Zamora has the feel of an old fashioned Castilian provincial capital. It is an architectural jewel with the 14th century bridge over the beautiful Duero River, the keep, gate and moat of the ancient Moorish castle, its many Romanesque churches and the narrow, cobblestone pedestrian streets of the Old Town. Our visit will include the 12th century cathedral and museum which has an impressive display of 15th and 16th century Flemish tapestries that tell the story of the Trojan War. The afternoon will find us at a hacienda farm where we’ll have a taste of their organic products and their blockbuster red wines made from the region’s tempranillo grape. Included rustic lunch. Segovia is a beautiful town of Old Castile, full of light and space. A World Heritage Site, its most prominent historical monuments are the towering Roman Aqueduct and the elegant Alcázar. Our guided tour begins with the impressive first century aqueduct that once transported water from the Fuente Fría River, 11 miles away. After free time and lunch our tour continues at the fairy tale like Alcázar. One of the inspirations for Walt Disney’s Cinderella castle, the Alcázar was originally built as a military fortress and later became a residency for the monarchy. Afternoon visit to the Valley of the Fallen, a monumental memorial to those who fell during the Spanish Civil War and the burial place of General Francisco Franco. 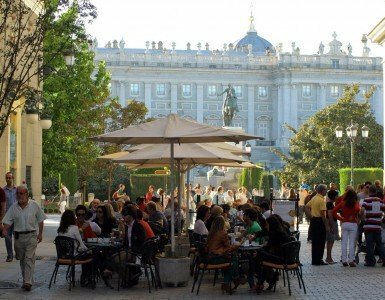 The day concludes with a scenic drive along Madrid’s regal avenues and plazas until we reach the fabulous Madrid Villa Real Hotel (2 nights). Orientation walk with your tour manager. Evening free. 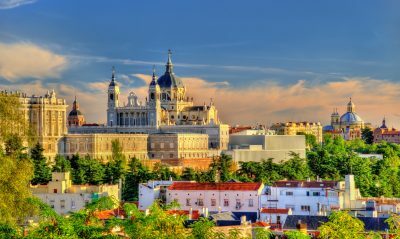 Spain’s largest city, as well as the nation’s capital, Madrid is the political, economic and social center of the country. It is home to the monarchy, the Royal Palace, the parliament and internationally renowned museums. Rich in history, dating back to the 9th century, Madrid balances past and present with its old world architecture set against bright lights and modern skyscrapers, lively evenings and a vivacious culture. We begin our day at La Catedral Almudena and then make our way toward Plaza Oriente to visit Madrid’s Royal Palace. Former home to Spanish royalty, it now houses famous works of art, the particularly ornate king’s dressing room, and the world’s most complete set of Antonio Stradivarius string instruments. The morning concludes at the Mercado de San Miguel, one of Madrid’s oldest and largest markets, now converted into a gastronomical and culinary center! Afternoon walk through the Botanical gardens of Retiro Park followed by an exploration of Spanish history and culture at one of Europe’s most acclaimed art museums, El Prado, featuring famous works by Velázquez, El Greco and Goya. Included farewell dinner at Sobrino de Botín, the world’s oldest restaurant (est. 1725), famous for its roasted meats cooked in a cast iron wood burning oven. Morning transfers to Madrid airport. Pre tour: If you choose to arrive to Madrid early you will be met by our driver at the airport and transferred to any Madrid city center hotel. For arrivals to Madrid on Day 1 of the tour your flight should arrive to the airport no later than 11:00. Suggestion: Central Spain October 7-16 and Andalucia October 17-29 fit back to back. Most of the walking on this tour is not difficult but you will find some of it to be uphill, particularly in Toledo and Trujillo. Be prepared to spend a few hours a day on your feet. Age is not important as long as you are reasonably fit and a good walker. Our tours are not suited for anyone who has mobility issues or problems with knees, back, heart or obesity. If you have mobility issues this is not the right tour for you. Please call us if you have questions. Day 1 transfers from a designated Madrid city center point and Madrid Barajas Airport to Toledo. Day 10 transfers to Madrid airport. 9 nights’ 4 and 5 star hotel accommodation with breakfast; 3 dinners and 2 lunches including beverages (wine or beer or soft drinks and water). 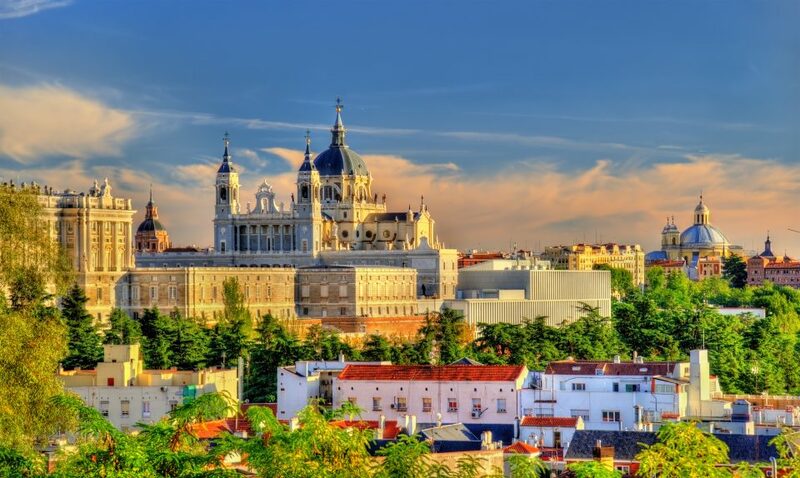 If you are visiting Europe only for the 10 days of our tour you will want to purchase a round trip flight to Madrid. The Toledo transfer from the city center will be at 13:30 and the airport pickup is at 14:15. Included morning transfers to Madrid airport will be by taxi. There are no included transfers to the Toledo train station. From the hotel it is a 10 minute taxi ride to the station from where you can catch trains to all destinations. Most of the walking on this tour is not difficult but you will find some of it to be uphill, especially in Toledo and Trujillo. Be prepared to spend a few hours a day on your feet. Age is not important as long as you are reasonably fit and a good walker. Our tours are not suited for anyone who has problems with knees, back, heart or obesity. We have space available for three singles on each of our tours. They are provided with single-use double rooms. Please contact us for availability prior to booking.